Can perches be made of branches with the bark on? They can be made of almost anything, as long as they are the correct dimensions for your birds. Check out the chicken perches page for more explanation. Return to Chicken Perch and Nestbox Questions. I've read that it is good to add a perch to the brooder when laying hen chicks are about 3 weeks old, but I'm not sure what the perch should look like. Do you have photos, or will you describe when and how to introduce the chicks to perches? The rule of thumb with perches is that the foot of the bird should wrap around it about 2/3 of the way. Being a bit too big is healthier for their feet than being too small. Wooden dowels make good perches even tree branches. If you use tree branches you might want to sterilize them with boiling water, just to make sure there are no mites hidden in the bark. Not knowing the size of your chicks or brooder, can’t be real specific as to the size you should get. How do you make a nesting box out of a 5 gallon bucket. Use a piece of wood (1x4) for example, screw it in place in front of the 5 gallon bucket to help keep it stable. You can also screw the bucket down to what ever you have it placed on. Try to keep your nesting box 18 to 24 inches off the ground. Fill with straw and chicken and wait for your eggs. I have just bought some chickens (2) and a night coop. Unfortunately, despite assurances from the person I bought the coop from I think it is a bit small. Basically there are no perches in it. Do I need perches in a night coop? I have some perches that my new chickens can use during the day when they are out of the coop. Chickens by nature like to perch. But, no they do not need perches. I am new to keeping chickens. Before I build my coop I want to make sure that it is big enough. I plan on having about four or six hens for egg production only. Is it necessary for the hens to have individual nest boxes or will six hens, for instance, share three or four nest boxes? One nest box each is a luxury; not a bad idea, but not necessary. Four should be plenty for collecting eggs. I’ve learned over the years that keeping 2 or 3 plastic or wooden or stone “eggs” in the nests at all times makes the hens more interested in using the nests. It seems to help them feel they are building a clutch to brood, a natural instinct, and less like something keeps stealing all the eggs. I am new to the backyard chicken. We have our first chicks and are making our outdoor coop for them. I had read something about perches but haven’t been able to find it again. Are perches or nests supposed to be higher? Can they be on the same wall? And what is recommended outdoor enclosed space for 12 chickens? We have old dog pen that's 24x20 and 6 ft high with an additional 4x4x6 that's enclosed with roof and ventilation but we know we'll need to add onto that space but are not sure how much. Is another enclosed 4x4x6 OK or will we need more? Thank you, your site has been very helpful. Covered chicken enclosures are important for their protection. The coop should lock up tight at night keeping anything larger than a mouse out. For the healthiest chickens and eggs free ranging and access to fresh vegetation is vital or a pen large enough to continue to grow grasses with their constant presence. The size pens you mention will quickly turn to dirt and then mud in wet weather. Many people keep chickens in dirt pens, with no access to vegetation, but this lowers the quality of diet and raises potential for disease and deficiencies. There are formulas for determining the minimum amount of space for chickens in a pen, but I would ask you to consider the most you can give them. The more, the better. Indoor coop space, where chickens will roost and spend days indoors due to cold, windy, rainy or snowy weather, should allow about 4 square feet of floor space per bird. Roosting areas or perches should allow about 3 linear feet per bird. For standard laying breeds I use 2” x 4” lumber about 3’ off the floor of the coop. I like to place nests at or just above the floor. Chickens naturally go to roost at the highest perches they can reach. 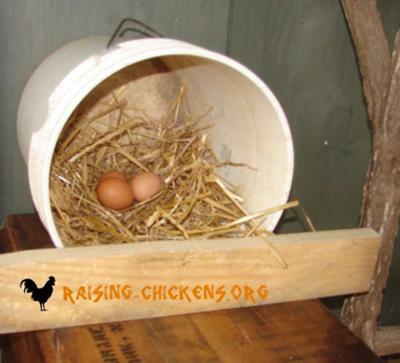 If nests are near perch height you may find chickens roosting on nests, loading them with droppings during the night, making it hard to harvest nice clean eggs.